Author Rick Niece capitalizes on his Ohio childhood stories in the third and final book in the nostalgic Fanfare for a Hometown Series. "The plan was to read them [the stories] to Mom as she rested in Queen Anne's comfort [her special chair] while receiving supplemental oxygen through a cannula in her nose. Through my stories, I secretly hoped she might breathe in streams of rejuvenating oxygen from the lungs of life's good memories relived." Yet Rick Niece's stated idea never unfolds quite as he hopes. The unexpected happens when he gets word that his mother (who has an incurable lung disease called idiopathic pulmonary fibrosis) is in the hospital and that her condition is worsening. The reality is that Mom is dying and the chance of her being his fact checker providing accuracy to the retelling of past stories is very slim. Flying to Arizona from Arkansas has its hiccups. With delays in Chicago, Rick and his wife Sherée arrive in Tucson, getting to his mom's 4th floor hospital room moments before visiting hours are over. Relieving his dad and brother Kurt, Rick decides to keep watch over mom by spending the night in the waiting room. The following morning, Rick is surprised to see his dad at Mom's beside. 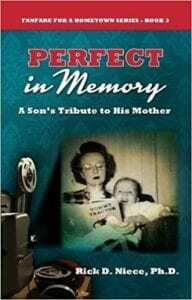 While stories over the course of three days pore out from his parents including how they met and their intense love for one another, they also send up red flags of his father's denial and his mother's fear of death. Niece, a retired university president turned author, identifies his three-book memoir series as automythography. Defined as "a work of nonfiction that looks reflectively at what we think we remember, and how we think we remember it," the term not only describes how Niece recalls his familial memories, but also offers a realistic picture of how most people recall stories from their past. Niece divides his narrative into five sections, constantly alternating between the present and the past. While capturing his mother's dying moments, Niece seamlessly weaves in memories from his childhood hometown of DeGraff, Ohio. A mixture of comedy and poignancy, Niece covers a multitude of interesting themes in his tribute to his mother—from Avon soap pistols, the Easter Bunny, and Jesus bookmarkers to cement mixers, converted clubhouses, an unlikely Arthur Murray dance partner, African violets, and gin, just to name a few. In addition to his engaging storytelling, Niece aptly sprinkles in a variety of poetry that includes free form, metrical verse, acrostic, haiku, and shaped formats. Quill says: A wistful yet uplifting read, Perfect in Memory will seriously get you crying and laughing simultaneously.